Draft: 2013, St. Louis Cardinals, 1st rd. Marco Elias Gonzales…lives with wife, Monica, in Seattle…played 3 seasons (2011-13) at Gonzaga University, compiling a record of 26-7 with a 2.34 ERA…is highest draft pick (19th overall) in Gonzaga baseball program history…two-time West Coast Conference Co-Player of the Year; earned the honors as a freshman (2011) and as a junior (2013), sharing with Kris Bryant (Univ. of San Diego) both years…as a junior in 2013, earned John Olerud TwoWay Player of the Year honors…pitched for the USA Baseball Collegiate National Team in 2012, winning a Bronze medal...won four Colorado 5A State Championships while in high school at Rocky Mountain High School…father, Frank, played collegiately and was a 16th round draft pick of Detroit in 1989. 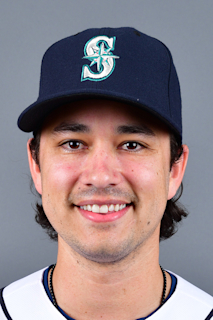 Totals - Went 13-9 with a 4.00 ERA (74 ER, 166.2 IP) with 145 strikeouts and 32 walks in 29 starts with the Mariners...Leaderboard - Among AL leaders, ranked 4th in walksper-9-innings (1.73/32 BB, 66.2 IP), 18th in ERA (4.00) and WHIP (1.22/32 BB, 172 H, 166.2 IP) and 25th in innings (166.2)...On a Roll - From May 23 - July 29, went 9-2 with a 2.61 ERA (23 ER, 79.1 IP) with 68 strikeouts and 16 walks in 12 starts…his 12 starts over this span included 9 quality starts…worked at least 6.0 innings in 11 of those 12 starts, including 4 outings of 7.0+ innings…allowed 2-or-fewer runs in 9 of those 12 starts, including 2 scoreless outings…surrendered 5-or-fewer hits in 7 of 12 starts... Strong September - In 4 starts in the month of September, went 1-0 with a 1.71 ERA (4 ER, 21.0 IP) with 17 strikeouts and 4 walks…among pitchers with at least 20.0 innings pitched in September, his 1.71 ERA was 7th-best in the American League/12th-best in the Major Leagues…worked at least 5.0 innings in each of his 4 starts...Tough on Lefties - In 121 plate appearances vs. left-handed batters, issued only 3 walks… among pitchers with at least 150.0 innings pitched, his 3 walks to lefties tied for 2nd-fewest in the Majors (also: Chris Sale-BOS and Alex Wood-LAD), behind Mike Minor-TEX (2)...Complete Effort - Recorded his first career complete game on June 29 vs. Kansas City…was 1 out away from his first career shutout, but allowed a two-out, RBI-single to Mike Moustakas…after Whit Merrifield's single to lead off the game, retired 22-of-26 batters faced through the end of the 8th inning…scattered 6 hits and struck out 7 while allowing 1 run in 9.0 innings of work...Home Sweet Home - In 14 home starts, went 5-3 with a 3.63 ERA (32 ER, 79.1 IP)...No Free Passes - Issued 1-or-fewer walks in 20 of his 29 starts, ranking T8th in the Majors...Control the Zone - Among Mariners pitchers with at least 150.0 innings pitched in singleseason club history, ranks T3rd for fewest walks allowed with 32 (also: Doug Fister, 2010, and Carlos Silva, 2008)...It Just Takes One - Four of his 13 wins came in one-run games, ranking T8th-most among Major League starters…made the start in two 1-0 Mariners victories, tossing 6.0 scoreless innings on April 24 at Chicago-AL and working 7.0 scoreless innings on May 23 at Oakland…became 1 of only 4 pitchers in club history (done 5x) to start multiple 1-0 wins in the same season…joins Wade LeBlanc (2018), Félix Hernández (2009, 2, and 2012, 4) and Ryan Franklin (2004, 2)...Pick Your Poison - Ranked 2nd in the Major Leagues/1st in the American League with 7 pickoffs, trailing only Eric Lauer-SD (10) for the Major League lead...July Success - In 4 starts in the month of July, went 4-0 with a 1.78 ERA (5 ER, 25.1 IP) with 24 strikeouts and 5 walks…limited opposing batters to a .196 (18x92) average against while recording a 0.91 WHIP (5 BB, 18 H, 25.1 IP)...An Even 10 - Became the 10th pitcher in club history (done 16x) to record at least 10 wins prior to the All-Star Break (last: Félix Hernández, 2015)...Finding a Rhythm - Did not complete 5.0 innings in 3 of his first 4 starts to begin the year… from April 24 through the end of the season, worked at least 5.0 innings in 24 of 25 starts. Totals - Was 1-1 with 6.08 ERA (27 ER, 40.0 IP) in 11 games, including 8 starts with St. Louis (1 G) and Seattle (10 G)... Strong Finish - Was 1-0 with 2.81 ERA (5 ER, 16.0 IP) and 17 strikeouts in 5 games, including 2 starts in September…in first 6 appearances, all starts, he was 0-1 with an 8.25 ERA (22 ER, 24.0 IP) with 15 strikeouts.... Seattle Debut - Made Mariners debut on Aug. 6 at Kansas City, getting a no-decision despite leaving with a 7-2 lead but did not complete 5.0 innings... Trade - Acquired from St. Louis in exchange for minor leaguer Tyler O'Neill (of) on July 21... Tacoma Time - Made 2 starts with AAA Tacoma, going 2-0 with 4.50 ERA (6 ER, 12.0 IP) while striking out 9…both of his starts were quality starts... AAA Recap - Combined with AAA Memphis (11) and AAA Tacoma (2), was 8-4 with a 3.14 ERA (28 ER, 80.1 IP) with 66 strikeouts in 13 combined starts... Memphis Man - Was 6-4 with 2.90 ERA (22 ER, 68.1 IP) with 57 strikeouts with Memphis... Brief - Made one start for St. Louis in second game of doubleheader on June 13 vs. Milwaukee... Beach Time - Made one start with High-A Palm Beach (STL) on May 7 vs. Lakeland. Missed the entire season after undergoing ligament replacement surgery on his left elbow on 4/15. The surgery was performed by Dr. Neal ElAttrache. Missed significant time on the disabled list with a left pectoral muscle injury...opened the season at Memphis (AAA) and made three starts before landing on the disabled list on 4/21 ...activated 5/9 and made just three starts again before going on the D.L. a second time (5/21-7/9)...made two starts each at Palm Beach (High-A, 7/10 & 7/13) and Springfield (AA, 7/17 & 7/22) upon being activated from the D.L. on 7/10...did not allow an earned run (2R) in the combined 11.1 innings in those starts... recalled to St. Louis on 9/1 and started vs. WSH that night; allowed 4 runs in 2.2 IP and was optioned to Memphis (AAA) the next day...rated as the 16th-best prospect in the Pacific Coast League by Baseball America and the 5th-best prospect in the Cardinals organization. Played at four different levels in his first full professional season, starting at Palm Beach (A), then moving on to Springfield (AA), before making his Major League debut with St. Louis and also pitching for Memphis (AAA)...Appeared in 31 games, making 26 starts, to post a 13-7 record with a 2.81 ERA in 156.2 innings with 148 strikeouts, combining his Major League and minor league time...Was purchased by St. Louis and made his Major League debut in front of home state crowd at Coors Field in Colorado on June 25 pitching 5.0 innings for a no decision, in a game the Cardinals eventually won. Doubled in his first MLB at bat...Ranked T7th among National League rookies with four wins...Earned his first Major League win and his first quality start, pitching 6.0 innings and allowing only one run in a start vs. CHI on 8/30 in Game 2 of a DH, after having been recalled as the 26th man on the roster...Finished the season winning his last four decisions, ranking T7th among National League pitchers. Won six straight decisions from 8/30 through Game 4 of the National League Division Series...Struck out a career-high nine batters vs. COL (9/14) in 5.2 innings, allowing one run on four hits in 97 pitches en route to a win...Did not allow more than two runs in any MLB start or relief appearance after his July 1 start at San Francisco...Batted .300 (3-10) with two doubles, T9th among MLB pitchers in doubles...Was T1st with Jacob deGrom (NYM) for most doubles (2) among rookie pitchers and T3rd among rookie pitchers with three hits...Ranked among Cardinals minor league pitching leader in wins (9, T5th), strikeouts (117, T4th), ERA (2.43, 3rd) and opponent BA (.238, 3rd). Collectively was 9-5 with a 2.43 ERA over 21 starts in the minors in 2014 (Palm Beach, Springfield, Memphis)...Named Cardinals Minor League Pitcher of the Month for August, posting a 2-0 record with a 2.67 ERA in five starts (30.1 IP)...Named Texas League Pitcher of the Week for the week of June 9-16, striking out a career-high 10 over 6.0 innings, allowing an unearned run on two hits vs. Northwest Arkansas (6/13)...Selected to the Texas League All-Star North Squad, but did not play due to promotion to St. Louis...Made 12 quality starts in the minors, registering a quality start in each of the 12 outings he pitched 6.0 innings or more...Struck out seven or more batters nine times, recording a 10.7 strikeouts/9 IP while in Springfield (46 K/38.2 IP)...Rated as the No. 1 prospect in the Cardinals organization by Baseball America. Listed as having the "Best Changeup" in the Cardinals organization in Baseball America's "Best Tools" survery...Appeared in six postseason games, all in relief...Won two games in the National League Division Series, becoming the 23rd pitcher in Major League history to win two games in a Division Series and the fourth Cardinals pitcher - joining Chris Carpenter, Adam Wainwright and Jeff Fassero...Earned a win in his first postseason appearance coming on in relief in Game 1 of the NLDS at LA (10/3)...Also earned a win in relief in Game 4 of the NLDS at Busch Stadium to clinch the series win...Appeared in three games in the NLCS vs. SF, taking the loss in Game 4, surrendering three runs in 0.2 innings...had made five straight scoreless postseason appearances going into Game 4...led all 2014 rookie pitchers with two wins in the postseason...Became the 4th rookie pitcher in postseason history to win two games in a Division Series joining Dave Righetti (1981, NYY), Jaret Wright (1997, CLE) and Francisco Rodriguez (2002, ANA)...His six postseason appearances were 3rd most by a rookie in the 2014 postseason trailing only Hunter Strickland (8, SF) and Brandon Finnegan (7, KC). Made eight appearances and six starts between the Gulf Coast League (R) and Palm Beach (A)...did not collect a decision in his first season of professional baseball going 0-0 with a 2.70 ERA, while holding opposing batters to a .212 (18-85) average... struck out 23 batters over 23.1 innings for an 8.87 strikeouts/9 IP mark...at Palm Beach posted a solid reverse split and held right-handed batters to a .148 BA (9-61)...was very effective with runners on base, holding the opposition to a .194 BA (7-36)...did not allow a first inning run in any of his starts in the Florida State League...struck out five batters accounting for all the outs in a relief appearance vs. GCL Mets (7/29)...rated as the No. 5 prospect in the Cardinals organization by Baseball America and listed as having the "Best Changeup" in the Cardinals organization by Baseball America's "Best Tools" survey. September 11, 2018 Seattle Mariners activated LHP Marco Gonzales from the 10-day disabled list. August 27, 2018 Seattle Mariners placed LHP Marco Gonzales on the 10-day disabled list retroactive to August 24, 2018. Cervical muscle strain. August 5, 2017 Seattle Mariners recalled LHP Marco Gonzales from Tacoma Rainiers. July 24, 2017 LHP Marco Gonzales assigned to Tacoma Rainiers. June 14, 2017 St. Louis Cardinals optioned LHP Marco Gonzales to Memphis Redbirds. June 13, 2017 St. Louis Cardinals recalled Marco Gonzales from Memphis Redbirds. May 12, 2017 LHP Marco Gonzales assigned to Memphis Redbirds from State College Spikes. May 8, 2017 LHP Marco Gonzales assigned to State College Spikes from Palm Beach Cardinals. May 7, 2017 LHP Marco Gonzales assigned to Palm Beach Cardinals from Memphis Redbirds. April 4, 2017 Memphis Redbirds placed LHP Marco Gonzales on the 7-day disabled list. March 13, 2017 St. Louis Cardinals optioned LHP Marco Gonzales to Memphis Redbirds. October 3, 2016 St. Louis Cardinals recalled Marco Gonzales from Memphis Redbirds. September 9, 2016 Memphis Redbirds activated LHP Marco Gonzales from the 7-day disabled list. April 7, 2016 Memphis Redbirds placed LHP Marco Gonzales on the 7-day disabled list. March 21, 2016 St. Louis Cardinals optioned LHP Marco Gonzales to Memphis Redbirds. October 14, 2015 Marco Gonzales roster status changed by St. Louis Cardinals. October 5, 2015 St. Louis Cardinals recalled LHP Marco Gonzales from Memphis Redbirds. September 2, 2015 St. Louis Cardinals optioned LHP Marco Gonzales to Memphis Redbirds. September 1, 2015 St. Louis Cardinals recalled Marco Gonzales from Memphis Redbirds. July 23, 2015 LHP Marco Gonzales assigned to Memphis Redbirds from Springfield Cardinals. July 16, 2015 LHP Marco Gonzales assigned to Springfield Cardinals from Palm Beach Cardinals. July 10, 2015 LHP Marco Gonzales assigned to Palm Beach Cardinals from Memphis Redbirds. May 21, 2015 Memphis Redbirds placed LHP Marco Gonzales on the 7-day disabled list. May 9, 2015 Memphis Redbirds activated LHP Marco Gonzales from the 7-day disabled list. April 22, 2015 Memphis Redbirds placed LHP Marco Gonzales on the 7-day disabled list retroactive to April 21, 2015. April 3, 2015 St. Louis Cardinals optioned LHP Marco Gonzales to Memphis Redbirds. September 2, 2014 St. Louis Cardinals recalled Marco Gonzales from Springfield Cardinals. August 31, 2014 St. Louis Cardinals optioned LHP Marco Gonzales to Springfield Cardinals. August 30, 2014 St. Louis Cardinals recalled Marco Gonzales from Memphis Redbirds. July 7, 2014 St. Louis Cardinals optioned LHP Marco Gonzales to Memphis Redbirds. June 25, 2014 St. Louis Cardinals selected the contract of Marco Gonzales from Springfield Cardinals. May 16, 2014 LHP Marco Gonzales assigned to Springfield Cardinals from Palm Beach Cardinals. January 21, 2014 St. Louis Cardinals invited non-roster LHP Marco Gonzales to spring training. August 2, 2013 LHP Marco Gonzales assigned to Palm Beach Cardinals from GCL Cardinals. July 2, 2013 Marco Gonzales assigned to GCL Cardinals. June 19, 2013 St. Louis Cardinals signed LHP Marco Gonzales.